Most cases (if not all) make your iPod Touch or iPhone a lot thicker and havier. And they hide the beautiful design of these marvelous pieces of technology. Screenprotectors make the screen less reactive and might interfere with the lightsensor. After having tried some of these cases, I finaly found the right one: the "Le Royale for iPhone and iPod Touch" from Crumpler. The iPhone or iPod Touch fits nice in this leather sleeve. It will also hold the iPhone3G without a problem. Keep it in the case to protect. Take it out to use and enjoy the beauty of the device! 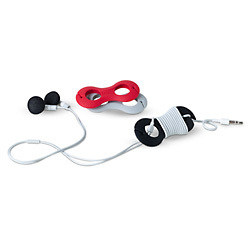 For my earphone, I use Belkin Tunetie.